Let Canva help you create your own uniquely designed tickets to make your event extra special. If you’re organizing an event, then custom, well-designed and affordable tickets may be just what you’re after. After all, event tickets aren’t just for granting entry into the event, they’re also a great way of drumming up excitement leading up to it. Use Canva’s easy-to-navigate interface to get creative with your event tickets easily and with minimum costs. Simply pick out any of our amazing templates and tailor your design any way you like. With Canva, you’ll be able to design a stylish and eye-catching event ticket that creates the right kind of buzz long before the event takes place. 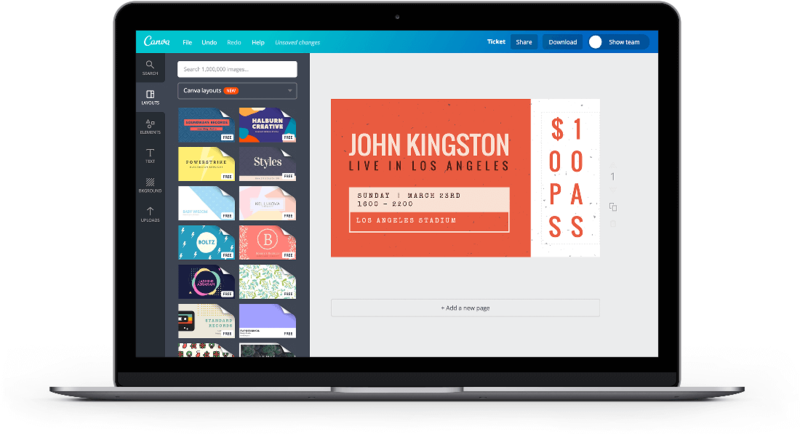 Create a new Canva account to get started with your own Event Ticket design. After selecting a template that suits your occasion, you can easily customize it with event details, zippy copy and your own images and logos. Don’t have an image? No problem. You can select a striking image from our extensive collection to make your event ticket stand out. When we say extensive, we mean it, because with Canva you have access to a library of over 1 million stock photos, images and design elements to make your event ticket your own. We have a huge assortment of images that are free, and the great news is that any premium images that take your fancy are priced at only $1. Affordable and stylish event tickets? Yes, it’s a win-win. Canva makes receiving feedback and collaboration super easy. With just a few clicks you can share your event ticket design with contacts, colleagues and friends with the option for them to either view or edit. You can even email your design directly to anyone you like or simply get a shareable link for those who need a direct URL. Are you looking for feedback on social media? Great! With Canva, you can tweet your amazing event ticket design to your followers or even share it directly on Facebook — this way even Aunt Becky can have her say. Remember when you’d go to an event, and then after it, stick the ticket to your bedroom wall? Those were the days. Event tickets can be more than just entry passes, and Canva helps you to create a sentimental piece of art. When you print them out, they’ll be so impressive that your attendees won’t even think of throwing them away. Once your event tickets are ready, we make it simple to print and ship. You can simply click on the “Download” button and save your event ticket as a PDF to print on your own. Or, alternatively, we can help you to professionally print your designs, complete with crop marks and bleeds. Are you looking to save money on printing and would rather distribute your event tickets via email? That’s all possible too. You can save and download your design in high resolution — and luckily, all Canva designs look fantastic on screen too. How can I add branding to my event tickets? Create an Event Ticket design that is instantly recognizable by uploading your logo, using your brand color palette and consistent fonts. Is it possible to collaborate with a team in designing my event tickets? Collaboration in Canva allows you to design with a team. To allow other people to edit your design, simply tick the box next to ‘Share/email as an editable design’. This will give them access to edit your design in their personal Canva account.